Spring has started to arrive at the NovaBirds cam! Sure, we're still getting a few flurries here and there, but for the most part, the temperature is rising and the snow is melting. Along with the climate changing, the birds are gearing up for mating season and are also on their return migration from the south. There have been lots of new visitors. There have been flocks of Common Grackles, Red-winged blackbirds, the first American Robins, and swarms of Common Redpolls. I even spotted a Fox Sparrow making a brief stop by the feeder area as well. If you listen carefully on the cam, you can hear lots of birdsong in the background, as eager birds are trying to find mates. You might also notice much more bickering going on amongst the birds, as they are getting much more territorial this time of year! A Sharp Shinned Hawk looks for unsuspecting songbirds. 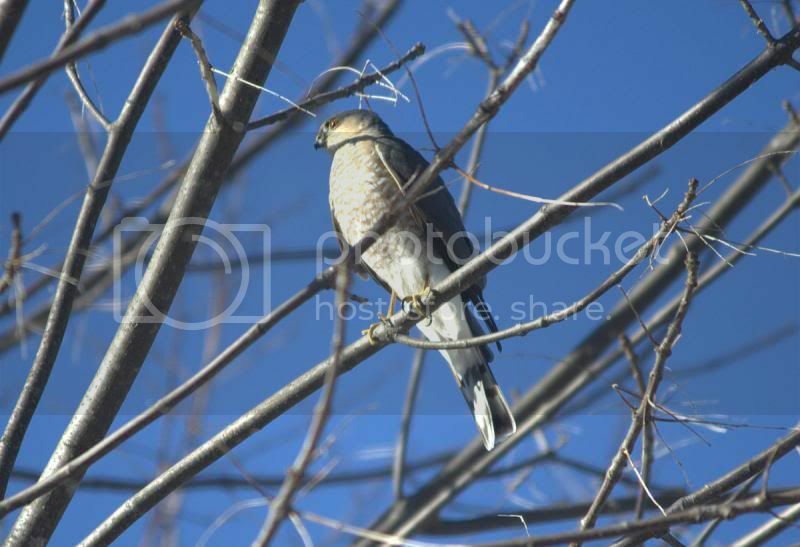 There has also been a few visits from a little Sharp Shinned Hawk. He's been chasing the little songbirds around, and I suspect (from feathers on the ground) that he may have caught one or two! By the end of this month, I will be switching over to the Hummingbird cam...soon our buzzy little friends will be returning! I cannot wait to see them once again! Oh! And don't forget to check out the Gallery for all the latest photos!